The arguments previously advanced have suggested that most individuals do not characteristically respond to aversive events with aggressive behavior. 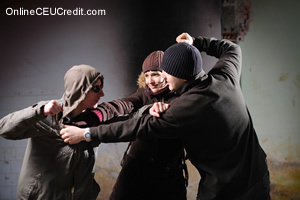 Recall that Bandura (1973, 1979) proposed that many diverse responses may result from aversive events, individual reactions may range from dependency, withdrawal, psychosomatic symptoms, and self-anesthization with drugs and alcohol, to aggression, increased achievement, and constructive problem-solving. These reactions may vary for the same person across different situations and may vary for different people within the same situation. We have adopted the concepts of learned helplessness (Seligman, 1975) and self-efficacy (Bandura, 1977) to account for the differential effects of aversive events on social behavior. According to Seligman (1975), learned helplessness is produced when an individual learns that the outcomes s/he obtains are independent of any voluntary responses. That is, favorable or unfavorable outcomes may occur regardless of what behaviors the individual does or does not display; thus, the event is perceived as being uncontrollable by individual behavior. There is a crucial distinction between learned helplessness behavior and partially reinforced behavior. In partial reinforcement paradigms, favorable outcomes are not achieved or unpleasant events are not avoided (positive and negative reinforcement) unless the individual engages in a critical behavior. The appearance of outcomes, then, is partially dependent on the organism (i.e., outcomes can be controlled in part by individual behavior). Voluntary behaviors (such as aggression) learned under partial reinforcement procedures are very resistant to extinction (Patterson et al., 1975; Ulrich et al., 1973). However, the primary consequence of learned helplessness is that individuals believe their voluntary behavior does not make a difference in their outcomes. Their beliefs decrease the likelihood that any voluntary response, including aggression, will be employed in attempts to maintain or gain control over outcomes. Aggression, a voluntary response, would be very weak if it were acquired under learned helplessness conditions, but this response would be very resistant to extinction if it were acquired under partial reinforcement conditions. The notion of self-efficacy in Bandura's work (1979) is closely related to the idea of learned helplessness. According to Bandura, two important determinants of behavior are 1) whether the individual believes that s/he can perform a behavior (efficacy expectation) and 2) whether the behavior will produce a given outcome (outcome expectancy). An individual may experience helplessness and/or loss of control over outcomes either because s/he cannot perform a necessary behavior (low efficacy expectation) or because s/he is not likely to receive the outcome even if s/he performs the necessary behavior (low outcome expectancy). Individuals may display quite different reactions (e.g., aggression, depression, or apathy) to potential loss of control, depending upon their efficacy and outcome expectations (see Table 1). We might anticipate aggression to be a primary response for those individuals who believe that they can perform the required behavior but anticipate not being rewarded for their performance. This effect is similar to Ulrich's findings (Ulrich et a!., 1973) that an abrupt termination of reinforcement increases the likelihood of aggression. In each instance the individual has a high efficacy expectation or sense of efficacy for successfully performing the required behavior, but experiences an abrupt loss of outcome control (due to low outcome expectancies or loss of reinforcement). If these people have learned to successfully obtain either social or economic rewards through coercive action, they may initiate aggression in an attempt to regain the perceived or actual loss of outcomes (i.e., regain control). On the other hand, individuals with low efficacy expectations do not feel competent in dealing with their loss of control. Consequently, they are riot likely to attempt to regain control over outcomes, and they are likely to experience either depression or apathy. Changing life events, self-efficacy and aggression: As an individual matures through the life cycle, s/he will encounter a number of major life changes which can disrupt the level or rate of positive and negative consequences to which s/he has adapted. Some of the most important life events producing particularly strong positive or negative reactions are interpersonal changes (e.g.. death of a spouse): a change in marital satisfaction or status; a major change in health of self or family member; and major financial or business changes (Holmes & Rahe, 1967). Frequent changes in life events can produce higher levels of stress, increase the likelihood of depression or anxiety (Johnson & Sarason, 1978), as well as increase the risk of major behavioral disruption after the event occurs. The responses to stressful life events will vary' as they do for other events of an aversive nature. Individuals with strong efficacy expectations are more likely than people with weak efficacy' expectations to perceive the life event as controllable, anti thus, they may attempt to control the outcomes by a voluntary response. High perceived efficacy individuals are more likely to use responses (including aggression) that previously' have proved to be successful for them and/or others in terminating similar aversive experiences. Either direct experience with negatively reinforced aggression (Patterson & Cobb, 1973) or vicarious experiences with successful aggression (Bandura, 1977) can increase the likelihood of this mode of responding. However, only' a small proportion of high-efficacy individuals, when exposed to aversive life events, are likely to engage in aggression to reestablish control over outcomes; that is, they may try many different non-aggressive strategies before they resort to violence. Individuals with weak efficacy expectations, on the other hand, are likely to perceive the stressful life events as uncontrollable (Bandura, 1 977; Leventhal, 1970; Seligman, 1975). These individuals may try to minimize the intensity of the aversive event by engaging in "blunting" strategies (Miller & Grant. Note 3). For example, they may engage in activities previously proven to be pleasant (e.g., eating and/or sexual behavior. listening to music, or sports) or may attempt to minimize the intensity of the aversive experience by self-anesthization with drugs or alcohol. If these blunting activities prove inadequate, the individual is likely to withdraw or perhaps display symptoms of learned helplessness, depression or apathy, including loss of appetite for eating and sexual activities (Seligman, 1975; Miller & Grant, Note 2). In short, changing life events can produce diverse reactions, depending upon whether the event is perceived to be controllable or uncontrollable, and whether blunting activities adequately minimize its aversive intensity. - Stuart, Richard B., Violent Behavior: Social Learning Approaches to Prediction, Management, and Treatment, Brunner/Mazel, Inc.: New York, 1981. The preceding section contained information about analyzing violent behavior from a social context. Write three case study examples regarding how you might use the content of this section in your practice. According to Bandura, how are individuals with weak efficacy expectations likely to perceive stressful life events? Record the letter of the correct answer the CEU Answer Booklet.